Philadelphia 76ers guard Markelle Fultz (20) dunks against the Indiana Pacers during the fourth quarter at Bankers Life Fieldhouse. For all their radical tendencies as an organization over the last half-decade, the trappings of an old-school, bully ball team have always been there for the Sixers. Drafting a parade of centers at the top of the lottery certainly influenced the path ahead of them, but even once they found the foundational big man the Sixers mostly continued to play traditional around him, to the chagrin of many (including yours truly). 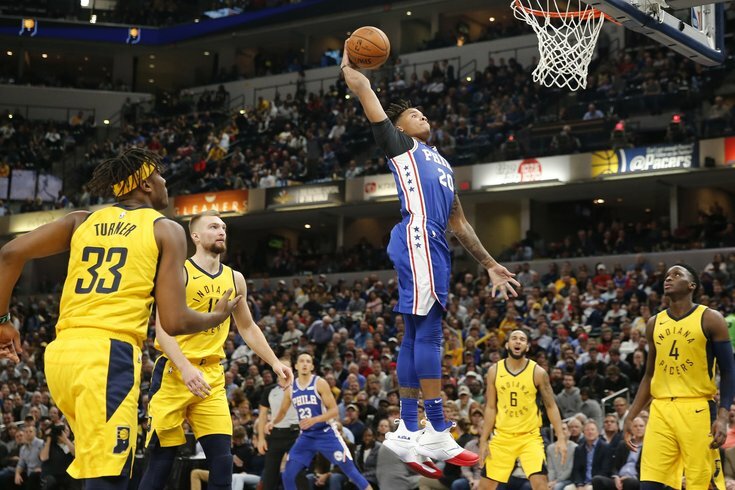 But necessity is the mother of invention, and the Sixers didn't have a lot of choices outside of experimentation on Wednesday night against the Pacers. Down Mike Muscala in the rotation, they were without a bench shooter and a potential option at backup center who has quickly earned Brown's trust. With Dario Saric struggling, it has been Muscala who has been asked to step up and play crunch-time minutes at the four in recent weeks. So it was time for Brown to get a little funky, especially after Amir Johnson came out and looked like he should have Yakety Sax playing in the background. And while the returns weren't overwhelming, there were some looks the Sixers tried that they need to keep toying with early in the season in order to discover the best version of themselves by the spring. To underscore here — I don't know if turning to smaller lineups was Brown's goal all along, or a product of Johnson looking more cooked than a Thanksgiving turkey. Whatever the case may be, he went away from Johnson as the night wore on and tried some smaller lineups that need to be looked at throughout the year. The most telling decision of the night came early in the third quarter, with Brown deciding to go to Markelle Fultz off the bench just under four minutes into the period, bringing him on with rookie guard Landry Shamet. Philadelphia was set up with a lineup of Fultz-Shamet-Covington-Simmons-Saric, putting a trio of guys Brown trusts to shoot next to his young ballhandlers. On the first possession with this group on the floor, the Sixers generated a three for Dario Saric out of a Ben Simmons post up. The primary difference here vs. the rest of the season was Saric simply getting it going on Wednesday night, cashing in on the open looks generated by the attention his teammates draw on the block. The more important signs, frankly, came on the defensive end of the floor. Philadelphia has struggled to get stops when they've gone smaller so far this season, with their oft-leaky defense on the perimeter being exposed without a true rim protector. But members of the second unit, including Markelle Fultz, put in the work to slow down penetration from Indiana's guards and executed switches well on top of that. One of my favorite moments in the game came midway through the third quarter, with the Pacers putting Fultz in pick-and-roll action. He fought hard to stay over the initial screen from Sabonis, switched to prevent the early entry pass, and the Sixers executed the off-ball switch beautifully to get Dario Saric on Sabonis in the post. A contested hook was all Indy could muster on the play, and the Sixers would eventually score on a Landry Shamet dunk following the stop. The advocacy for small ball has been tied heavily to Philadelphia's need for more shooting around their guards. If they can defend well on top of that, especially this early, it lends hope for their long-term ability to use these wrinkles. The burliness that hurts Saric in perimeter defense can be an asset when holding ground against backup centers, and the defensive upside with more athletes on the floor simultaneously is obvious. Fultz deserves a decent share of the credit for things running smoothly during the back half of the third quarter, and Brown made his life easier by getting more shooting around him to close it out. With Wilson Chandler finally back and able to contribute, there were four shooters (if you include Joel Embiid) around him at times, and that simplified the game. When Embiid came to set a screen at the top of the key, all Fultz had to do was get past the first line of defense and it was smooth sailing from there. To continue with the Fultz theme, an uptick in pick-and-roll action has been warranted from the moment he stepped onto the floor, but it has been hard to execute with his jumper largely a mess and teams willing to concede the perimeter shots to Embiid. How do you credibly run the play if no one fears the shooting options? Well, you change the personnel so that's no longer the case. We didn't see a ton of it against the Pacers, but the Sixers added a wrinkle I don't believe we've seen much of in the past, using Redick as the screener in pick-and-pop sets with Fultz. In two end-quarter sequences, the combination of Redick and Fultz created two great scoring opportunities for Philadelphia. Fultz drew free throws with the space created for him in the first half, and when the defense converged on Fultz in the third quarter it generated a look from the perimeter the Sixers will live with on most occasions. I don't know how much you want to run things like this — Redick already has to generate a lot of offense for Philadelphia as a screener, which can't be great on his frame — but it's a great understanding of personnel. Teams will always respect Redick as a shooter, and even when he's slipping screens instead of leveling opponents, the moment of hesitation is all the offense needs to open windows of space. The things Shamet does well as a rookie were largely to be expected. Maybe we undersold his ability to come in and shoot right away, particularly as a "Mini JJ," as Brown calls him, but the threat was clear on the perimeter as early as the preseason for Shamet. At this point, it's expected for him to cash in on his open looks from the perimeter. What has been surprising throughout the team's opening stretch is his work on defense. It has not been consistently good and he has been hunted by a couple teams looking to find a crack in Philadelphia, but on the whole he has flashed the commitment and the awareness to at least be a solid team defender. A couple instances stood out to me during the game against Indiana, as shown below. Shamet benefitted from Thaddeus Young just coughing the ball up on that first sequence, but he still held up pretty well given the size discrepancy between the two players. And the work to get back in transition is probably the more important play and a perfect example of exactly why you should be testing out small-ball lineups as much as possible. It's a lot harder to get skewered on the break if you have more guys who can actually get back and make life difficult for opponents in transition. As we've talked about with Fultz, this is the key to Shamet earning the trust of the coaching staff and getting a chance to develop more as the season rolls along. The shot will come and go on any given night, but investing his energy on the defensive end will keep him firmly in the coach's plans so long as he is healthy.